Stephanie and Dominic Parker can currently be seen on Channel 4’s award winning series “Gogglebox”. The fourth 12-part series is currently airing every Friday evening at 9pm on Channel 4. 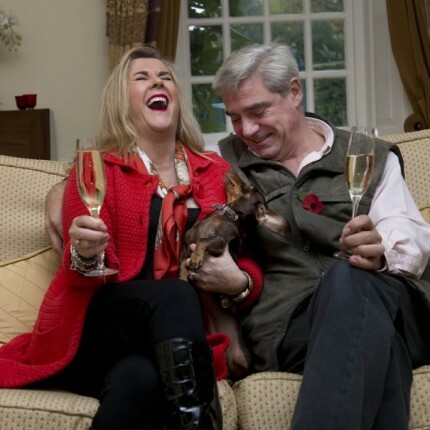 Outside of “Gogglebox”, Steph and Dom own and run The Salutation, a high-end, Grade-1 listed B&B in Sandwich, Kent which has hosted royalty and celebrities alike. Their first foray into television was as part of Channel 4’s “Four in A Bed”, although the Salutation didn’t win, they did achieve the highest scores for overall quality and off the back of their appearance, Steph and Dom were invited to appear on the first series of “Gogglebox”. “Gogglebox” features some of Britain’s most opinionated and avid TV viewers commenting freely on the best and worst television shows of the past week resulting in a highly entertaining and heart-warming glimpse of family life and the different ways we respond to TV, with Steph and Dom’s sofa-tipping and hilarious comments making them viewer favourites. “Gogglebox” became one of the most talked about and tweeted about shows of 2013 with the current series opening with 2.2million viewers and the second series picking up Broadcast Awards for ‘Best Original Program’ and ‘Best Popular Factual Program.’ “Gogglebox” also won the Royal Television Society Award in the ‘Popular, Factual and Features’ category and has been nominated for a BAFTA Television Award this year.